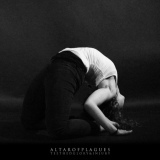 The first Altar of Plagues album not to consist of four very long tracks, Teethed Glory and Injury is a step sideways for the Irish band in many ways. Yet when listening to Teethed Glory and Injury alongside its predecessors, particularly the dark and experimental Mammal, it’s very much a continuation along the post-black path that the three-piece are hewing. Moving away a little from post-rock, Altar of Plagues has instead stepped closer to modernity by making limited use of electronics alongside the black metal. Don’t expect disco beats, far from it; the electronics are used to propel the dark atmosphere, to broaden the band’s palette without diluting the oils, to create an album that touches on the industrial harshness of the likes of Godflesh without mimicking its blunt mechanical power. Teethed Glory and Injury is black metal to its core, even as it broadens the genre’s boundaries and explores new grounds for the band. Taking seething black metal darkness as its key, the album has an atmosphere that is twisted and spiteful, yet capable of great beauty amidst it all. Opener Mills sets the tone well, presenting calm electronic percussion and post-rock guitar squeals alone, then together, at first harsh and ominous but becoming gentler, almost soothing despite the cacophony before switching suddenly to the next track, God Alone. It’s here that you truly hear the new side of Altar of Plagues, a ravenous yet strangely structured dance of madness (the music video is well worth a watch, mirroring the album artwork) that is clearly definable as an artistic performance yet also makes you very uncomfortable – something that works for the album as a whole. Riffs are pulsing squalls, the drums a torrential downpour, the vocals a vicious snarl; these three black metal standards work both with and apart from the subtle electronic mantel draped around the music, providing bursts of noise as well as a counterpoint to the upfront guitars and drums (both of which, it has to be said, are played perfectly. Drummer Johnny King has been underused in my opinion on past Altar outings, but he has come into his own with the varied and unpredictable performance here). Brief snippets of clean vocals are buried remorselessly beneath the music, the farthest thing possible from the stereotypically catchy ‘video track’ that you can imagine. Throughout the album, the band prove themselves adept at providing atmospheric soundscapes that work in and of themselves as well as being part of the album as a whole. Some bands would have stumbled in switching from the ten-minute-plus standard of Mammal to this, where the standard is just under five and the longest just under nine, but Altar of Plagues have managed it wonderfully. Take A Body Shrouded for an example, an initially calm technical rundown of guitar riffs suddenly hovering menacingly in the air atop feverish drum attacks. At just under five minutes in length it feels longer, but doesn’t waste a second in repetition, running onwards seamlessly into the pulsating Burnt Year, which throbs with a backing beat before breaking free into a organic, raging black metal attack atop it, pure in rage if not in sound, slowing and becoming breathtakingly melodic for a fleeting few beautiful moments at the end. Previously, the band wrote songs that didn’t so much fill the space they had as expanded to meet them – here, the space is shrunken to fit the songs ruthlessly, and it works incredibly well. The more you listen to this (bloody brilliant) album, the more you recognise and appreciate the songwriting as the work of a mature band pushing their sound onwards. Twelve Was Ruin’s industrial drone is a sort of car crash between Khanate and Jesu, agonising and mechanical at first, flirting with becoming delicate and human before returning to the harrowing squalls of sound, a final note of hope the emotional pay-off. This is an insistent, compelling album that gets under your skin and makes you return to it again and again, hearing new things each time. I’ve gone from being puzzled by it to being obsessed by it, and it’s a sure entry for the year’s best. Highly recommended. Note – the album is released by Profound Lore in the US.